Join the intellectual challenge and start your RBS Executive Master of Business Administration studies! 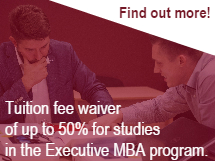 The Executive MBA program at Riga Business School is designed for experienced managers to grow personally and professionally, to fulfill their leadership potential and to unlock unexplored talents. The program focuses on core management areas via exploration of business decisions from executive perspective, uses extensive case studies and peer-to- peer learning to examine the latest management and leadership practices and adds an international dimension to the learning experience. During the 20 months of the program, a small group of carefully selected individuals journey through the realm of management theory and practice, dive into the art of strategic thinking and interact with experienced professors, peers and industry representatives from all over the world. EMBA is a platform where lifelong friendships are born, strong business contacts established and individual achievements are exceeded only by those of a team. For individual consultation please fill the form. This site is managed by the RTU Riga Business School. External links to other Internet sites should not be construed as an endorsement of the views or privacy policies contained therein.